The drive shaft is one of many components which is vital to a car’s functionality. Responsible for transferring energy from the gearbox to the wheels, when a drive shaft is impaired, the entire vehicle is impaired. Once a drive shaft undergoes damage, it will still operate. However, putting further stress on a damaged drive shaft will eventually result in its demise. For this reason, you need to be cognizant of signs that your drive shaft is damaged. Here are 4 signs that you require drive shaft repair. An almost sure sign that your drive shaft is impaired is if you notice excessive vibration coming from the underside of your vehicle. This vibration usually comes as a result of a U-joint being loose or worn. As these vibrations continue, they will put undue stress on other components of your drive shaft. Should this stress continue for too long of a period, you can expect your drive shaft to deteriorate entirely. In essence, if you do feel vibrations moving throughout your vehicle, you should have your vehicle immediately inspected by a professional mechanic. Do you hear loud grinding or thudding noises coming from your car every time you fire it up? If so, you drive shaft could very well be the culprit. Again, when the U-joints contained within a drive shaft suffer deterioration of some sort, they cause undue stress to be put on the rest of the components in the drive shaft. Undue stress can prevent the shaft from rotating sufficiently, resulting in loud noises. If you’re hearing these loud noises, it’s advised to have your car checked on as soon as possible. You want to eliminate the problem before it turns into an even bigger problem. Do you find it much more difficult to make turns in your vehicle than you used to find it? If so, there’s a chance that your drive shaft is the source of the problem. Difficult turns can be caused by a bevy of different problems, including a broken serpentine belt and a malfunctioning steering rack. An impaired drive shaft is just one of many possibilities. If you’re not well-versed in the anatomy of automobiles, it can be difficult to tell what the exact problem is. In any case, if you’re having trouble turning, you should take your vehicle into a repair technician. Any experienced mechanic will be able to pinpoint the problem and carry out a repair. Squeaking noises can come from your car for a variety of different reasons. Everything from worn brake pads, to non-lubricated U-joints, to new tires can cause this sound to occur. However, if you’re hearing loud, squeaky noises coming from your car even when it’s barely moving, there’s a very good chance that your drive shaft is the problem. The most likely case is that the U-joints in your drive shaft are in need of lubrication. Ideally, you will be able to get rid of the sound through a simple lubrication. 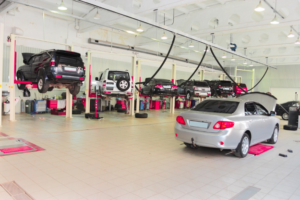 In any case, you should take your car in to be inspected by a professional mechanic. This is the only way to know the true source of the issue. Do You Require Drive Shaft Repair? Have you noticed any of the signs reviewed above? Do you require drive shaft repair? If so, we here at King Transmission Company can help. We’ve been in business for decades, and are well-versed in the repair of drive shafts. Regardless of the model of vehicle that you have, we can, and will accommodate you.